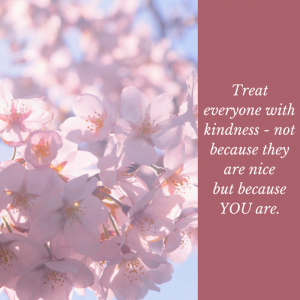 Treat everyone with kindness – not because they are nice but because YOU are. What good does that do? That mentality is what has gotten our society in the mess we are in today! Yes there are certain actions that definitely need to be punished and people who don’t deserve kindness. But Paul tells us in his letter to the Ephesians (4:32) to be kind and compassionate to one another, forgiving each other, just as Christ Jesus forgave you. WOW! Does that mean even the waiter who is rude? Does that mean even the lady at WalMart who acts like she hates her job? Does that mean my spouse when he/she is in a bad mood? Does that include my bratty teenager with an attitude? Surely that doesn’t mean my “climb-the-ladder-at-any-cost” coworker? Yes……….we are to be kind Christians and compassionate because we don’t treat everyone with kindness because they are nice. We treat them with kindness because WE ARE. Look for someone who needs a little kindness today and brighten up their day by sharing a little of yours. This entry was posted in devotional, inspirational, motivational, spiritual on August 31, 2017 by Deanna Young.